Staffing based on patient acuity is central to ensuring quality patient outcomes, a stable nursing workforce and financial viability. Nurse staffing represents as much as 50% of a hospital’s labor costs and over 20% of total operating costs. Further, nurses provide 95% of patient care and are proven to have the greatest impact on patient outcomes. Some want to believe that staffing comes down to a numbers game, where the number of skilled staff fluctuates in accord with patient volume. But this doesn’t address patient acuity, nursing competencies, skill mix, the patient complexity of care required or the resulting workload. To ensure positive patient outcomes, you must do more than a ratio match. When you align nurse and other staffing to your patients’ needs for care, you valuably augment nursing knowledge and judgment, and assure accurate and safe staffing, while keeping costs down. A strategic, evidence-based nurse workforce plan enables a new level of CNO and CFO partnership to support the highest possible quality of patient care, staff safety and cost management. 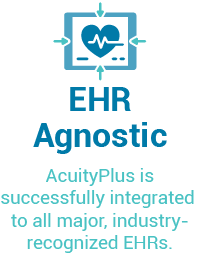 AcuityPlus provides evidence-based methodologies to determine the quantity of care (acuity) and type of care (complexity) required for each patient. A formal research process is conducted on a regular basis, with interim projects as needed to maintain the validity and transportability of each methodology – a unique feature in the industry, available only through Harris Healthcare. AcuityPlus, our Acuity-based staffing solution, uses existing clinical documentation from your electronic medical records system to classify patients. This is known as Transparent Classification. Our approach eliminates any duplication in data entry, minimizes workload for nursing staff, and eliminates any bias in patient classification. It also decreases cognitive stacking for RNs, improves data validity and results in improved documentation. Nurse documents patient care in EHR. Patient care needs feed to AcuityPlus via HL7. 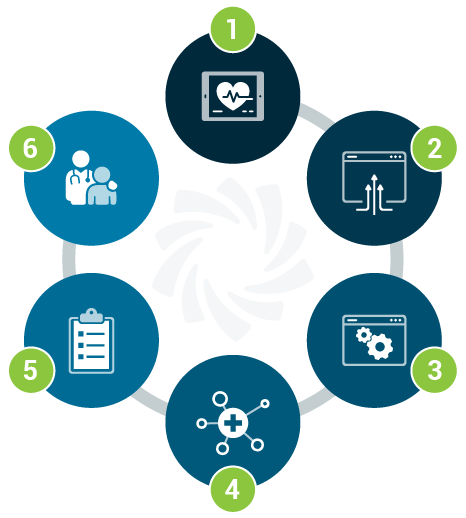 AcuityPlus uses evidence-based methodologies to determine patient acuity and complexity. Steps 1-3 provide the patient’s Transparent Classification. This occurs in real-time and takes no additional effort. Staff proceed to their shifts. The 5 Rights of Staffing are addressed, allowing your organization to provide optimal patient care. AcuityPlus functions in the background. Most staff will have little-to-no interaction with the system—with most seeing reports only. Data for benchmarking, management and research is easily accessible and continually available. To help CNOs, Directors of Nursing, CFOs and shift managers better understand the impacts staffing has on patient care, AcuityPlus offers multiple tools for real-time adjustments, forecasting and continuous process improvement. We provide extensive management report capabilities as well as the ability to customize standard reports or create new with an included report writer. Project staffing requirements based on changes to ADT census data, acuity, patient mix and staffing parameters. Create “what if” scenarios to evaluate impact of change in salaries or staff numbers before implementing change. Easily manipulate multiple variables for budget preparation. Manage the discharge process through analysis of patient readiness for transfer or discharge and determine costs associated with delays. Allows quick determination of potential number of available beds in disaster or emergency situations. Evaluate the relationship between staffing (experience and expertise) and patient and staff outcomes. Add custom indicators and define ‘treatment areas’ to track specific patient populations or events. Discover the impact of staffing on patient and staff satisfaction and work-related injuries. AcuityPlus users cannot imagine staffing, planning and budgeting any other way. If you are staffing based on any method that does not take into consideration data-driven, evidence-based patient acuity, AcuityPlus will make a difference for you and your organization.